I WAS awake but I did not want to open my eyes. My head and throat hurt, just like yesterday. My Dad spoke to me and I saw him and my sister by my bed. Just then Mrs Cameron, a neighbour, came into view. She handed me a lovely doll in a red cape with a hood. I loved that doll from the start. As I croaked my thanks two strange men appeared. One lifted me on to a stretcher and I was whisked away and hoisted into a dimly lit ambulance, away from my home and folks. That was not the worst of it — my family was not coming with me. Why not? What had I done wrong to leave without a hug? I was alone for the first time in my life and was terrified. I do not remember any explanation being given as to what was going to happen to me. Not then, not ever. Nor do I remember arriving at the Helensburgh Infectious Disease Hospital, nor the routine of the place. One memory I have of this terrifying time is of being taken to visit my Mum in another ward. I could only stand at the side of her bed as physical contact was not allowed. I remember standing at an upstairs window and seeing two small figures waving to me. This only added to my unhappiness. I do remember arriving home and crying and crying. Everything was so different. I was so shy I would not allow my sister to help me get ready for bed as she always had done. We were like strangers. I had not been allowed to bring my beloved doll with me to comfort me and to give me courage. It must have been a dreadful time for them when I could not explain why I was behaving like this. I had been away for many weeks I have been told. Further trauma awaited me when I returned to school. I did not know teacher, pupils or work. I had loved school by the time I was ill, but I had run away every day when I first started. Now thankfully things are explained to children. Scarlet Fever means isolation for the patient but at least they will know that being taken away from home is not their fault. However, time heals and a normal life ensues. 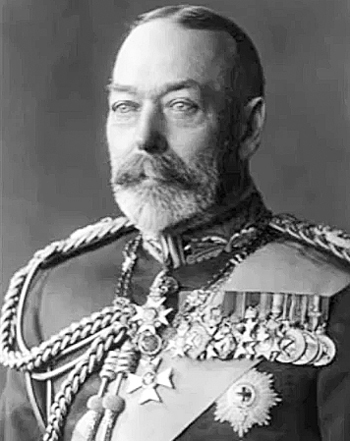 A joyous time for us children was the Silver Jubilee of King George V (pictured above) and Queen Mary on the 6th May 1935. The preparation for it created great excitement. The Municipal Buildings was the centre of attraction bedecked with flags, bunting and flowers with Jubilee colours everywhere. Prominent was a large portrait of the royal couple which we thought was splendid with the King in uniform and the Queen in a magnificent dress. The town echoed the efforts of the above with the added attraction of fairy lights. Many buildings had flags protruding from their windows, in red, white and blue and the yellow and red of the Scottish flag made the private buildings eye-catching. The children had their own flags, two if they were lucky, the Union Jack and Lion Rampart, to wave at every opportunity. Most of the shops had impressive window displays with special Jubilee themes and always the obligatory portrait centre stage. We children spent ages admiring these displays. We commented on, argued about and had votes to decide which was the best. I do not think that we ever decided on a winner. The fun was in the involvement. The river, always busy was now crowded. Not only did we have the sugar ships at Greenock, the many commercial vessels and city tugs and the steamers we now had the naval ships and their manoeuvres. All the ships were dressed overall, and a splendid sight they were. The game of remembering the different colours on the funnels of the steamers on both sides of the river belonging to different companies was forgotten, now we wanted to find out the difference between a destroyer and a frigate, for example. At least the boys did. I was pretty half-hearted about the exercise. At school we learned about the importance of the long reign of the monarch from 1910, with lots of pictures of the Dominions. The children of the 30’s were very aware that they were the privileged members of the British Empire and proud of it. I liked this history better than wars and dates. Better still on Friday afternoon before the big day Provost Andrew Buchanan, his wife and a few councillors came to the school to commemorate the event. The Provost’s wife presented us with a sweet-filled beaker and a flat, golden tin box of toffee with portraits and dates on them. I kept that tin box for years for my crayons. I still have my own and my husband’s beaker. The ever-generous Provost Buchanan had supplied the gifts. He also donated three splendid chairs for the Council Chamber — we had our own Court then — the redecoration of the Victoria Hall and the Firework Display to commemorate the event. On the 6th of June 1935 we were marched to the Hermitage Park. We sat on the grassy, hilly bank in front of Hermitage House. I remember the speeches went on for ever but we were not bored. The pageantry of it all with the Council officials in their handsome robes and beautiful chains of office, both gifted earlier by Provost Buchanan, and invited lady-guests in lovely outfits and beautiful hats, the music and jolly crowd, we were just happy to be part of it. There were also crowds of people laughing and joking and children getting up to all sorts of mischief running round the trees and in bushes and being told off and ignoring the commands to keep us amused. Eventually it was over but we had the Firework Display to look forward to so we went home happily anticipating the entertainment to come. The town was crowded with visitors streaming off buses and trains all day and happily joining in the celebrations. We had buses from Glasgow every fifteen minutes, both the SMT and Baillie Bros buses. The latter had a daily Oban run. The pier was closed for the great event we had heard so much about. The music including the Pipe Band, and the happy crowd greeted us as we approached the pier. At that time we knew so many of the local populace it was a gathering of mostly friends for us. It was a thrill for us to be out so late. The event was to start at ten o’clock. A bonfire was lit on the hill, as was the case in every town on the River Clyde, and as a result the whole river was lit up as far as the eye could see. At last the first firework burst in the sky to be followed by rockets sending a shower of sparks everywhere, Roman Candles and types I did not have a name for kept us entranced as the night sky glowed with colour and noise that seemed to go on and on. I liked the cluster type best. The gasps and sighs from the crowd added to the atmosphere. I had never seen anything like the finale, a portrait of the King and Queen in the sky. That was magic indeed. I dare say it would be considered pretty average by the fireworks available today. But, to me, my first public Firework Display has never been surpassed for excitement. When other royal occasions sparked of reminiscences the Silver Jubilee was sure to come up. Someone once remarked that little did we know that for many of us our future husbands were also in that audience! Isa remembered being given a bun! I don’t recall such a thing. It seemed at times that we had been at different venues so varied was our recollections of that day. The one unanimous verdict was that The Silver Jubilee was a wonderful event in our young lives. 1938 brought the Glasgow Empire Exhibition to Bellahouston Park in Glasgow. It ran from May to December. In the first place the journey to the city was a thrill. Normally such a trip was to buy our summer or winter outfits or at Christmas to the Kelvin Hall and the pantomime. Going to the Exhibition was in another category altogether, partly because we had heard so much about it that seemed incredible. Although we did not visit very often I remember a great many scenes and experiences I enjoyed with my father and sister. I found it exceeded all expectations. It was a wholly magical experience, one I have never forgotten. Even if some details are hazy the memory of the sheer joy of these visits remain. There was the huge Cascade that emptied into the Loch. There were more fountains than I could count at the time because I could not see the end of the display. They were lit up frequently with coloured lights to the enchantment of the viewers. My abiding memory is of beautiful white buildings, water features galore, the like of which I had never seen and did not see again until I stood in the garden of the Petrograd Palace in Russia many years later. Flags and multifarious floral displays, things I was familiar with but never in such abundance and to such exotic, artistic advantage. I was awestruck by the beautiful American Hotel which was shaped like a ship, one which was beached on a big hill. I was told that the hill was too steep to climb to eat there, but I suspect that the prices were too! The tall, narrow Tower of Empire, which we called Tait’s Tower, soared behind the hotel, a tribute to Thomas S.Tait the leading architect. The fabulous designs of the buildings were mostly modern. Many had sculptures and statues incorporated in the facades. The United Kingdom was my favourite with its golden statues high above the entrance and two huge golden lions guarding the whole asymmetrical edifice. It was just so different and of course British! There were also lots of splendid traditional buildings as well. We saw the Scenic Railway and the Hall of Mirrors and many novelty items. My Dad was intrigued by the notice of the giraffe-necked women of Burma, whatever that meant. We entered a building where there were stall-like arrangements. Occupying them were several tall, stately woman who walked erectly and gracefully about their business, while others were sitting employed in making something. They all had many brass rings round their necks and legs. They all appeared to have long necks. Or so I believed for many years until I was told this was not the case. One of them came close enough to us to have eye-contact. I felt uncomfortable, as if I had done something wrong by looking at her. My Dad must have felt the same because he hustled us out without looking at the other ‘rooms’. Every country in the Commonwealth had a building representing their country. I remember reading the names but cannot recall the appropriate buildings. People of the Empire, such as South Africa, Australia and New Zealand wandered around the venue dressed in their some startling, national costumes. The Canadian Mounted Police were in uniform and the favourites of the crowd. At the bandstand there was an amazing overhanging background mural depicting a huge fiddle and musical instruments. The music was popular and the bandsmen very dashing in their red uniforms. We were glad to sit for a while and enjoy the experience. The transport provided was of open carriages. I felt very self-conscious to begin with but the other passengers were so cheery waving as we passed and so much to see that the discomfort soon passed. We had kept the Clachan until last because we had been told that it was quite a large area to visit. I had never been to a Highland village and I was entranced by what I saw. The river with its bridge and boats, the heather and the fields with cattle and herdsmen; the shepherd with his flock; the piper in full Highland rig playing the Scottish tunes I recognised. The thatched cottage with the Highland woman sitting in the porch busy stirring soup in a cauldron seemed perfectly reasonable to me at the time. All in the city of Glasgow! I loved the story I was told later about Queen Elizabeth (who became the Queen Mother), when she was talking to the soup-maker and asked what ingredients were in the soup. “Well there’s onions intilit and carrots and leeks intilit and barley intilit and so on." "And what is intilit?" asked the monarch? The answer was “in to it”. I thought this was hilarious at the time but later felt the Queen must have been sorry she asked. Our first visit had been a resounding success and I hoped that we could soon go back. We did enjoy a few more visits but, of course, they never evoked the high emotion of that first wonderful day. Our placid world was shattered the next year. On Saturday 3rd September 1939 war with Germany was declared. At school we began to hear that older siblings of our school friends had been killed in action, fathers too. I sat next to a friend for maths. She was absent for a day or so. When she returned she told us of the dramatic events in her life. She added that the only clothes she was possessed were the ones she was wearing. During the air raid an incendiary bomb had landed on a neighbour’s house opposite Hope Terrace in Cardross where she lived. Her Dad had gone to help the neighbour to fight the fire. When he returned he found his wife, daughter and baby son standing outside their blazing home. After a direct hit, it was completely destroyed the same night as Cardross Church suffered the same fate during a raid on Greenock on the 5th May 1941. The local lads too young to be called up for military service at eighteen years old became messengers in the ARP. They met at the depot with their bikes. As my future husband was crossing Colquhoun Square with a friend they heard the bombs land. We were huddled in the cellar trying to sound nonchalant about the terrifying experience of the sound of the bombardment. He did not know then that a friend and ARP messenger, Bobbie Low, had been injured coming out of his garden in Colgrain on his way to the depot when a bomb exploded. The shrapnel from the blast injured his leg so badly that it had to be amputated. His sister became a neighbour of ours. She told us that she been on duty as a VAD when her brother was admitted to the local hospital. She was the one who had to tell her parents the dreadful news. After the Clydebank blitz on the 13th and 14th March 1941, when the town was razed to the ground, many refugees had came to Helensburgh to be billeted here. Others slept in the Parish Church of the time. St Columba Church ran a canteen. After a raid on Glasgow the pupils who lived locally came to Hermitage Secondary School. We had to sit three in a seat in some classes which did not go down well! Mothers with young children often had to sit at the back of the class. Life was utterly changed. We grew up fast as we coped with blackout, rationing, shortage of bananas, oranges, jam, sweets. We saved our sugar ration and took it to R.S. McColl’s shop at 12 West Clyde Street for a pound of boiled sweets — they lasted longer than chocolate! Travel was severely restricted. A permit was needed to travel to Garelochhead and granted only if you had business there. The windows of the bus would be blacked out. Multifarious new organisations sprung up, Air-raid wardens, Fire-fighters for the incendiary bombs, Home Guard, Voluntary Services to mention a few. This was nothing to the dreadful news every day with headlines such as, ‘a number of our aircraft are missing; a number of ships have been sunk and fierce fighting continues on many fronts, Europe, the Middle and Far East and Japan’. We all knew loved ones and friends who were involved in the danger zones. My cousin’s husband served in the Middle East, and he was away from home for six years. I wrote to him at many addresses in Italy and Egypt. We were never hungry and we had coupons for clothes. Jumpers were ripped out and reknitted. Fathers’ dinner suits were unpicked and made into costumes for the female members of the family. Somehow life went on and we adapted to it. In the next few years many of us were in uniform.